the real story of Jesus Christ? fable of Christ brought us!" Shocking as it may seem to the general populace, the most enduring and profound controversy in the subject of Christianity is whether or not a person named Jesus Christ ever really existed! "Jesus is a mythical figure in the tradition of pagan mythology and almost nothing in all of ancient literature would lead one to believe otherwise. Anyone wanting to believe Jesus lived and walked as a real live human being must do so despite the evidence, not because of it." "There is not a conception associated with Christ that is not common to some or all of the Savior cults of antiquity." "The gospel story is an artificial, non-historical work. It has been fabricated from source materials that can be identified and traced to their incorporation into the gospels. There is not a particle of hard evidence that 'Jesus of Nazareth' ever existed. What do these people know that the Church isn't telling you? "Prayers offered up in Christian worship in the earliest days of the faith were addressed to 'Our Lord the Sun,' evidencing that 'primitive' Christians were quite in the spirit of Pagan forms and ideologies." 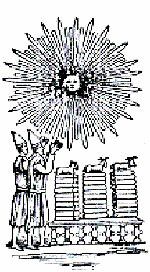 "The Christian religion and Masonry have one and the same common origin: Both are derived from the worship of the Sun. The difference between their origin is, that the Christian religion is a parody on the worship of the Sun, in which they put a man whom they call Christ, in the place of the Sun, and pay him the same adoration which was originally paid to the Sun." "The Sun has attracted the attention of mankind for adoration all over the world from the very beginning of human history. It has attained the position of pre-eminence among the deities of nature in ancient times. 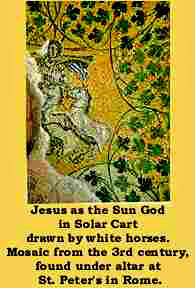 The prominence and glory of the solar orb, its beauty and splendor, its importance in the creation and maintenance of life, its regularity in diffusing light and enlightening the whole earth, its primal role in the cosmic evolution and consequent mystery surrounding it, had secured for the Sun a history of interest and importance equaled by none to which every age and every race has contributed its pages." The story of Jesus as portrayed in the Gospels is revealed to be nearly identical in detail to that of the earlier savior-gods Krishna and Horus, who for millennia preceding Christianity held great favor with the people in much the same way as Jesus does today. Thus, the Jesus character is not unique or original, not "divine revelation." These redeemer tales are similar not because they reflect the actual exploits of a variety of men who did and said the identical things, but because they are representations of the same extremely ancient body of knowledge that revolved around the celestial bodies and natural forces. 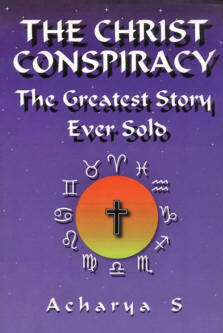 The result of this mythmaking has been The Christ Conspiracy - The Greatest Story Ever Sold. In this highly controversial and explosive book, archaeologist, historian, mythologist and linguist Acharya S marshals an enormous amount of startling evidence to demonstrate that Christianity and the story of Jesus Christ were created by members of various secret societies, mystery schools and religions in order to unify the Roman Empire under one state religion. In making such a fabrication, this multinational cabal drew upon a multitude of myths and rituals that already existed long before the Christian era, and reworked them for centuries into the story and religion passed down today. From the very beginning of our quest to unravel the Christ conspiracy, we encounter suspicious territory, as we look back in time and discover that the real foundation of Christianity appears nothing like the image provided by the clergy and mainstream authorities. To wit, a miracle-making founder and pious, inspired apostles who faithfully and infallibly recorded his words and deeds shortly after his advent, and then went about promulgating the faith with great gusto and success in "saving souls." Contrary to this popular delusion, the reality is that, in addition to the enormous amount of bloodshed which accompanies its foundation, Christianity's history is rife with forgery and fraud. So rampant is this treachery and chicanery that any serious researcher must immediately begin to wonder about the story itself. We have seen that there is no evidence for the historicity of the Christian founder, that the earliest Christian proponents were as a whole either utterly credulous or astoundingly deceitful, and that said "defenders of the faith" were compelled under incessant charges of fraud to admit that Christianity was a rehash of older religions. It has also been demonstrated that the world into which Christianity was born was filled with assorted gods and goddesses, as opposed to a monotheistic vacuum. In fact, in their fabulous exploits and wondrous powers many of these gods and goddesses are virtually the same as the Christ character, as attested to by the Christian apologists themselves. "Egypt, the primeval seat of learning, was the high seat of Sun adoration. The Sphinx, with the face to the east, represents Harmmachus, young Horus, or the rising Sun. The orb is Osiris, the ruling god of day. In its descent it is the dying deity, going below to the land of Shades; but only to be resurrected as the victorious Horus, piercing the head of the dragon of darkness." In addition, in the catacombs at Rome are pictures of the baby Horus being held by the virgin mother Isis--the original "Madonna and Child."